Experienced indoor growers understand that not all horticultural lighting systems are created equally. In fact, there is a huge variance in technologies, efficiency, effectiveness and overall quality between the lighting fixtures available to modern horticulturists. Considering that light energy is the main driving force behind plant growth in an indoor garden, it only makes sense that an indoor gardener seeks the very best for his or her artificial lighting system. When looking for a quality lighting system, a horticulturist needs to examine the system’s ability to effectively convert electricity into usable light energy (photosynthetically active radiation or PAR). The amount of PAR a lighting system creates compared to the electricity it uses can help a grower determine the system’s overall efficiency. However, it’s not just the PAR to electricity draw ratio that an indoor horticulturist should be concerned with. How the light energy is delivered to the plants is another important point to consider. In other words, the type of reflector or specialty lens being used makes a big difference in how the plants “see” the light. Few companies have had as large an impact on the indoor horticultural industry as Hydrofarm. Hydrofarm and PARsource teamed up to develop the most efficient and effective double-ended (DE) HID lighting system in the horticultural market. That lighting system is known as the Phantom DE. The grower’s success was the key objective when designing the Phantom DE. The folks at Hydrofarm and PARsource realize that in order for a grower to continue to compete in a world with continuously rising energy costs, he or she needs a lighting solution that will efficiently convert electrical energy into PAR at the highest possible rate. With almost four decades of lighting expertise in their corner, Hydrofarm and PARsource integrated the highest quality components available into the Phantom DE Lighting System Series. 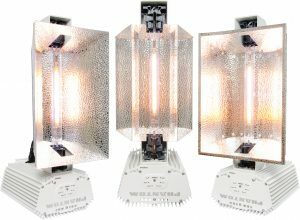 Available exclusively from Hydrofarm is the new Phantom Commercial 50 Series Lighting System. This system represents a decade of product evolution and refinement. The Phantom Commercial DE Lighting System features state-of-the-art double-ended technology that uniformly delivers optimal PAR levels to the plants. At the heart of the system is the Phantom ballast, which includes a high-precision microprocessor and premium RF shielding. Th e Phantom Series features an all-in-one design for maximum strength and optimal heat management. The reflector insert is easily interchangeable and there are a variety of reflector options available, including the Open Reflector, Enclosed Reflector, and the Super Deep Reflector. The Phantom DE Series includes a USB interface for full compatibility with the Autopilot PX1 Digital Lighting Controller. Many Phantom DE Lighting Systems are available with a dimmable option (750W and 1000W) and multiple voltage options. 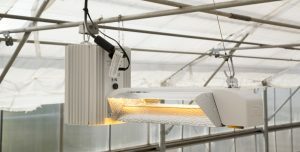 To prove it had created the most efficient double-ended lighting system available to horticulturists, Hydrofarm hired a third-party testing laboratory. Independent Testing Laboratories, Inc. (ITL Boulder) is the most experienced independent photometric testing lab in North America. The test compared eight of the most popular commercially available double-ended horticultural lighting systems. Based on the test results generated by Independent Testing Laboratories, Hydrofarm’s Phantom DE Open Lighting System and Phantom DE Enclosed Lighting System were ranked first and second place, respectively. There were a total of five testing categories: relative efficiency, total micromole output, micromoles per watt, absolute luminous flux, and lumens per watt. The Phantom DE fixtures placed first and second in all five categories. The Phantom DE fixtures also produced more plant usable photons per watt consumed, required fewer fixtures to meet desired micromole levels and had the lowest operating cost of any double-ended horticultural lighting system available. Put another way, the Phantom DE Lighting Systems offer the highest efficiency of any of the tested double-ended lighting systems. What makes a lighting system great is not just the bulb and ballast, but the material the reflector is made from and how the reflector is configured. All Phantom reflectors are made from a multi-layered European hammer-tone reflective material. The utmost quality of this material ensures a higher level of light reflectivity and overall longevity. The Hydrofarm staff understands that having the right tool for the job makes all the difference. That’s why it has multiple reflector options for the Phantom DE series. This basic, but bold, reflector directs light energy to the canopy below. It is ideal for small-sized gardens or for large commercial spaces when multiple fixtures are used in footprint cross-patterns. The Phantom DE Open Lighting System is designed to uniformly deliver optimal PAR value over a broad footprint. The Enclosed DE Reflector was specifically designed to concentrate the high output of DE lamps in a standard, traditional spread. The Enclosed DE Reflector creates super intense light when positioned close to the plant canopy or, if appropriate for the growing situation, a wider distribution of still-powerful illumination when raised higher. This reflector has an open roof or ridge vent for optimum heat dissipation. This reflector was designed by Hydrofarm’s in-house engineering team to fill the need for a DE reflector that delivers an ultra-focused light spread of maximum intensity. In other words, this reflector was designed to provide an intense downward focused light from a higher mounted position. The Super Deep DE Reflector is perfect for applications needing high levels of PAR concentrated on a less broad canopy. The Autopilot PX1 Digital Lighting Controller provides a centralized, dual-zone digital control over the Phantom DE Lighting Systems. The Autopilot PX1 allows the user to switch, dim, and/or boost multiple Phantom DE ballasts at once (up to 256 in each of the two independent zones). The trunk-line cable connection ensures seamless communication between the controller and all the ballasts in the chain. This digital ballast interface is easy to set up and control and is available at an affordable price. The cost of energy is constantly on the rise. If an indoor horticulturist wishes to continue his or her hobby or business, they need the most effective and efficient lighting system available. The Phantom DE Lighting System Series from Hydrofarm is extremely effective at providing usable light energy to plants, but it also does so in a very efficient manner. There is currently no other DE lighting system on the market that can provide such high levels of PAR in such a uniform and efficient manner. 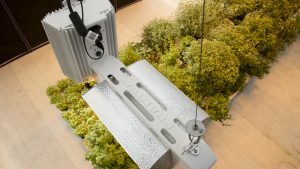 Over the course of a few garden cycles, horticulturists who implement high-efficiency lighting systems such as the Phantom DE Lighting System Series will be rewarded with a lower cost of operation and a higher return on investment. When teamed with the Autopilot PX1 Lighting Controller, the Phantom DE Lighting System becomes even more efficient. The future of indoor horticulture is all about efficiency. The grower who understands the importance of providing intense, uniform light as efficiently as possible will be the one who continues to compete in the years to come. The folks at Hydrofarm have designed an incredible DE lighting system based on the needs of the grower. The Phantom DE Lighting System Series, with its interchangeable reflector options, equips all indoor horticulturists from hobbyists to professionals with the right tool for creating abundant harvests as efficiently as possible. For more information call 800.634.9990, email info@hydrofarm.com or visit Hydrofarm.com.